"We're very happy -- looks like a million bucks!" We are blessed to have many happy customers who have generously shared their thoughts and beautiful installations with us to share with you. Meet some of our Inglenook customers! 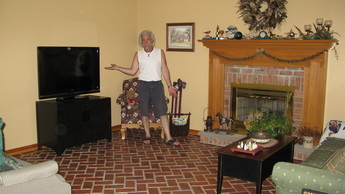 Purchased from Julie at Inglenook Tile the "thin" clay fired brick veneer for use for a floor in my living room. Followed Julies advice, used a 1/2" cement board, taped and cemented the joints over a 3'4" plywood subfloor over wood floor joists. Finished with a waterproofing glaze and Johnsons paste wax application, applied Johnson 2 x per year. That process turned the rough brick veneer into a glossed sheen and it is protected against spills and staining. Feels great even to walk on in bare feet and looks fabulous. A real brick floor at a sixth the weight. Great Product. 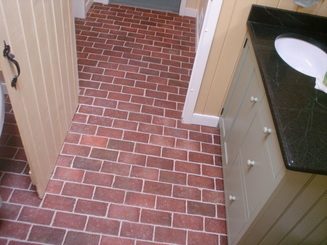 An excellent, handcrafted, custom brick product for floors, walls, and even ceilings. 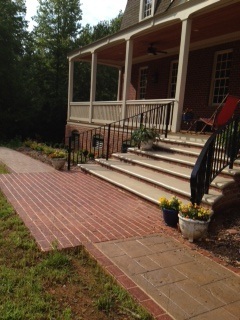 If you want brick tile that gives a historic look and feel there's nothing comparable. Our installer, who has worked with other brick flooring products, felt this was the best product he had encountered by far. The owner of Inglenook is very helpful and was able to meet schedule requirements even though every order is a custom manufacture. By the way, did I mention that the product is indestructible and if you have dogs it's perfect. All-in-all we couldn't be happier. We love the handmade tiles we chose from Inglenook Tile Design in the restoration of our 200 yr old farmhouse. Julie was more than helpful throughout the whole process, from selection to providing technical assistance during the installation process. Restoring a historic structure requires acute detail to attention when choosing materials. Julie provided the artistic talent which made our tiling project the success it is. One of the most pleasurable experiences we had while building our dream home was working with Julie from Inglenook Tile Design. She made the process extremely easy, bringing samples to our home and suggesting what would work best with our home design. Julie followed up with phone calls and emails keeping me posted on the process. Ultimately she provided a product above and beyond our expectations...within budget and on time!!! We get compliments all the time on our brick walls and floors and no one believes it is tile! I highly recommend if anyone is looking to add some great detail and value to their home, they consider using Inglenook Tile Design!! Your product was the perfect fit to create the look we were trying to achieve. I was aware of thin set brick being available, but it was the realistic look and feel of Inglenook's product that made it an instant choice. We wanted to create a barrel vault that felt like the real thing, not just from across the room, like a movie set where if you get up close the falsehood is apparent. At 20 feet and at 2 feet, this is the real stuff by sight and touch! Julie Good Kruger is an exceptionally talented and integrity filled designer. Her attention to detail is exquisite. The team work is so well orchestrated so all work is finished promptly. Her ability to authenticate the necessary product for the job at hand is executed to the 'nth' degree so everything comes together just as anticipated. Very positive experience all around with a finished product that is certainly 'high end'. LOVE my brick work ! Am looking forward to using her company on many future projects. Inglenook Tile was a great company to work with. We were building a historically accurate colonial home. I could not find this type of brick anywhere! The bricks are true made to order custom items. They lay like tile, but are brick---only they are very thin. I used them in my mudroom and laundry. I also laid them along the sidewalk outside my house. Ms. Kruger was wonderful to work with, and has a strong work ethic. Thanks for a enjoyable experience!" I have had trouble finding a good quality brick veneer since the 1970's. I didn't want a plastic-looking concrete product. Size is important to a trained eye, and most products are too small. 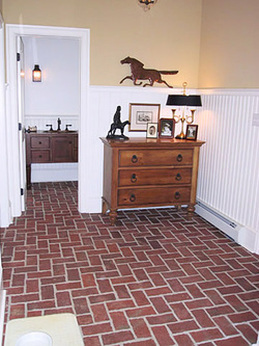 Recently, I needed a thin brick for a foyer, and found Inglenook Tile. I got some samples, and they were "right on the money." Everything was just perfect. When I call Inglenook, I can to talk to the owner, and that means a lot. I would give 110% assurance to anyone who is thinking about using Inglenook Tile. My floor looks absolutely gorgeous. It is exactly want I wanted. Woo hoo, countertop and faucet in! Still trim to finish, but I wanted you to see what you did! Love the floor, it would have been one smooth, modern box without it! The dog paw prints are so cute, haven't waxed that area yet, I'll send pics again when we are 100% it is a dream to cook here. Thank you for adding so much and talking me off the window ledge when my doubts assailed me! We are very happy, it looks like a million bucks! We had trouble finding the right product to cover our fireplace. We didn't have the masonry support to use regular bricks, and my husband remembered that we met you at the Historic Home Show in Valley Forge. He asked me to contact you, because you had exactly what we needed to complete our projects. What we hoped to accomplish is the look of a real brick fireplace, mantle and hearth, without having to use full bricks, and incur enormous expense to go back and retrofit the spaces. That would have been cost-prohibitive. You were very accommodating when we needed the tiles right away. We were under a time crunch, and needed the tiles quickly. When you were away from the office, you provided an alternate number to call, and we didn't have to wait. We feel very confident that if we refer people to you, they can be assured you would be easily accessible, very accommodating, and that you have a unique product that would make otherwise cost-prohibitive projects affordable. 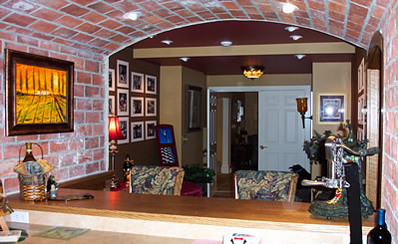 People who have seen our fireplaces tell us how much they love our "brick mantles and hearths." They have no idea that the "bricks" are actually tiles! When my husband and I began the search for flooring for our new country farmhouse we were happy to come across Julie and Inglenook brick work. Julie was so helpful not only on the phone but when we visited the facility to see the brick in person. We set out to brick our mudroom but was so impressed with the workmanship we decided to outline our fireplace area, brick the foyer, the pantry and the bathroom in the mudroom area, too. We hired an experienced brick layer that did the pointing technique Julie recommended and couldn't be happier. Everyone that visits our home are so impressed with the floor - It looks so good that we are always thinking what else we can brick. Of all the subcontractors used to complete our new home, it was Inglenook who stood out as making the process a pleasant one. Thanks Julie for your wonderful product and professionalism. The installer just finished the alcove above the stove, and it looks wonderful! We finished the backsplash a while ago, but I wanted to live with the effect before deciding on the rest. So the project is complete, if you would like to stop out and see sometime on your travels! Thanks again for the wonderful product you provide. I enjoy it every day! 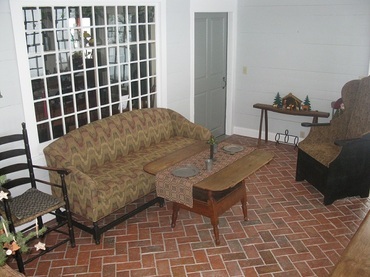 I wanted a brick floor in my restored log home, but did not have the floor depth to accommodate full-sized antique bricks. Most brick veneer is made to look like the "side profile." 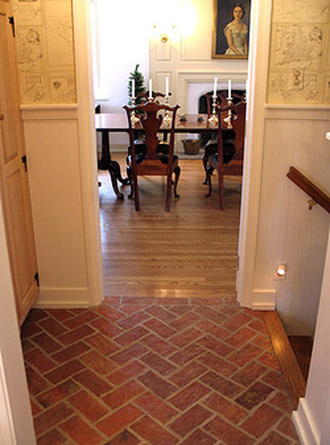 Inglenook offers the "top profile" in a hand cast brick, which is necessary to replicate the look, feel and coloring of a colonial brick floor. 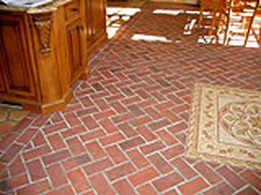 We have gotten so many compliments on our two Inglenook brick floors. After putting Inglenook brick in our kitchen, we liked it so much we decided to use it in our walk-out basement and adjoining laundry room. People are surprised when we tell them it isn't full-sized brick. Even my mother liked our antique brick flooring so much she wanted one, too, and now her kitchen floor is also Inglenook brick. Working with Inglenook Tile was a pleasure from start to finish. In the beginning, when I wasn't sure exactly what I wanted, they were very helpful in making suggestions and sending samples. Delivery of the order was as promised. I am very happy with the look we achieved, and I would recommend their product to anyone. We found your company on the internet, after months of searching for "authentic" flooring for our recently purchased farm house. We looked at a lot of different products without finding a satisfactory flooring product. Your product was exactly what we were looking for, and the end result exceeded our expectations. The reaction that we get from guests in our home is incredible. 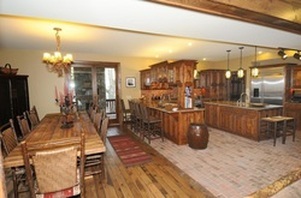 In addition, your help and instructions on application and finishing the floor were extremely helpful. Your customer service was excellent. EVERYONE that comes to our home comments on our floor! It has given the house exactly what we were looking for. Thanks again for your help and hard work! It was a pleasure to work with Inglenook Tile. We were able to speak directly with the owner who was extremely helpful answering our questions and offering advice. We wanted a tile that would have the look and feel of 18th century brick, and a product that could accommodate radiant heat. Inglenook Tile was the perfect solution. Visitors are always surprised to discover that the 'brick' floor in our taproom is so warm! We could not be more pleased with the product or the service. My kitchen is done! It turned out exactly as I had envisioned. Thank you so much for getting them to me, and for making the fleur de lis. 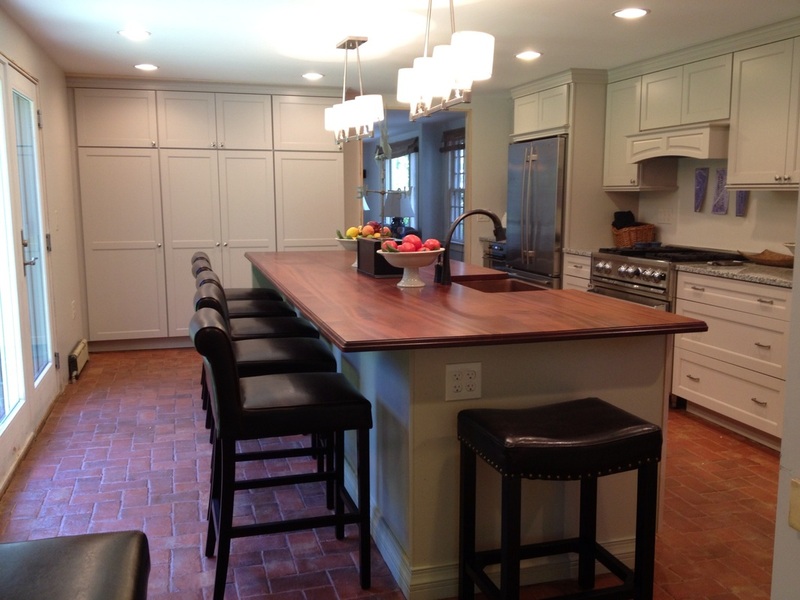 When we built an addition onto our kitchen, the antique brick flooring was a major challenge. 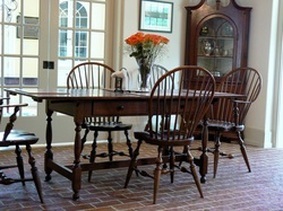 We loved the existing floor of beautiful, 200-year-old French pavers. We literally searched the world for more of the same tiles but there were no more to be found. Finding a floor that would complement these tiles was a lengthy process. When I found Inglenook tile, I knew that my search was over. The product itself is amazing. It has such wonderful texture and color variations which make it look authentically antique. It fit all my criteria for ready availability, superb quality, easy installation, carefree maintenance and a reasonable price point. When I contacted Julie about purchasing the tile, I soon learned that I was buying more than tile. I was impressed with the passion Julie had for her products. She is a true artisan and it shows in everything she does. I have never received so much personal attention and interest from a vendor. Julie helped me hand-pick each tile for 350 square feet of flooring. It is rare to have a company owner take so much care with a customer. Julie also helped me with another design challenge. We have a large skylight in the center of our addition which I wanted to highlight by putting a mosaic directly underneath in the flooring. Through her contacts in China, Julie sourced exactly what I had in mind and had it shipped at a very reasonable price. It is now the focal point of the room and adds such an artistic quality to an already beautiful brick floor. I would recommend Inglenook Tile to anyone looking for something special. In a world of ordinary products, it is so nice to find something unique that is both beautiful and affordable. You will not be disappointed and in fact, you'll probably be enriched by the whole experience of getting to know Julie. Jim Glessner is doing a great job laying our brick, and it looks amazing! I can't wait for you to see it. We did a running bond in the front hall, which runs down the center of the house, and empties into the sunroom with a herringbone pattern. Thanks so much! P.S. I met an interior designer last night at a party in West Chester, and was telling her about your incredible product. I told her to check out your website! I purchased brick tiles from Inglenook and had them installed in our 1870 Victorian Farmhouse's mudroom. They look fantastic - like they were installed when the house was built. The tiles we bought are irregular in both shape, surface and patina. This adds to the character and aged look. I would highly recommend Inglenook's tiles if you are looking for handcrafted, authentic looking material with a lower profile than traditional brick. 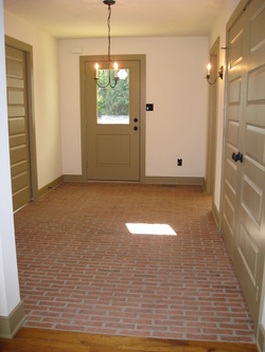 I just wanted to let you know that we just think of you all the time - we love our brick tile floor! We're living in the house now, and loving it. I wanted to let you know that sometime if you are in the area, you really should come see! I had a couple here yesterday who were interested in working with my architect, and they fell in love with my house. They also fell in love with my brick floor! I wonder if you could send me some of your business cards, as I often have people asking about the bricks, and I then I could easily send them your way. By the way, I love the website and the tiles look fabulous. I wish I could do another renovation, so I can use some of your tiles somewhere else! I love my horse tiles, and the kids think it is fun to try to find the leaves in the bricks. 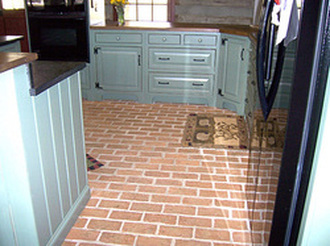 We were looking for a product that looked like antique bricks, was definitely not a fake product, with a thinner profile to accommodate our existing floor. Our brick masons installed the floor, and it came out looking like a real, full thickness brick floor. You created the tile for us with all the color variations, natural imperfections, and authentic look of real brick, thin enough to install without ripping up our existing floor completely. 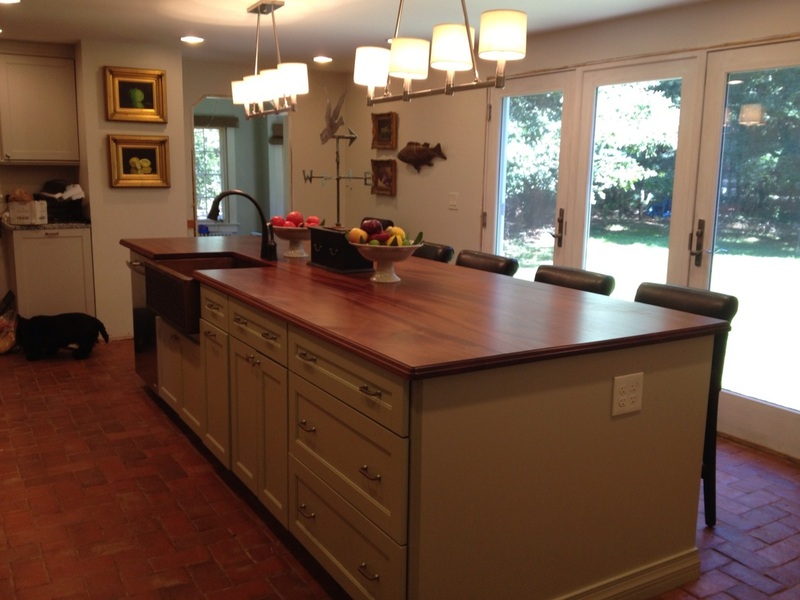 Our kitchen with your brick flows onto a screened porch with antique paving brick, and it is a seamless transition. The floor looks gorgeous. The masons wanted the link to your web site. They loved working with the tile, and want to recommend them to other customers. I am afraid the masons really want to meet you. One of them lives near you, and is so impressed with your tiles that you are like a rock star! My painting contractor and the brick mason both made me promise not to let their wives see our floor, or they would have to have it installed at home. However, it is too late! The owner of the painting company we used is marrying my best friend from college, they bought a new house, and your thin brick is going into their entryway as they renovate a house together! We love our floor!